At the veelage o Tsovinar wi a cemetery on the hill in the backgrund, Juin 2009. 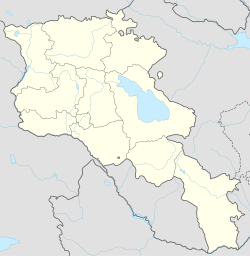 Tsovinar (Armenie: Ծովինար; umwhile, Kolakran) is a veelage in the Gegharkunik Province o Armenie. The name roughly translates tae "beach beside the sea". East o the veelage is the Urartian ceety o Teyseba (Odzaberd) foondit bi Rusa I, wi a cuneiform inscription nearbi. It is considered tae be the best preservit Urartian steid in the Sevan basin. Juist ootside o the veelage heidit sootheast are numerous stanes scattered athort the side o a hill. It is aw that remains o an auncient veelage destroyed durin a war lang ago. Some human bones an auld coins hae been foond in this aurie bi veelagers frae Tsovinar, attestin tae the story o wha haed happened here. No too far awa are twa sma single-nave kirks an ae. The kirk o Topi Galugh sits on a hill sootheast atween Tsovinar an Artsvanist, while the kirk o Surb Sarkis built atween 1100-1200 sits sooth o the veelage o Tsovinar on a promontory owerleukin a sma gorge. Next tae Surb Sarkis is a sma cemetery, an juist belaw the kirk in the gorge is a sma spring an cave. Further sooth are the remains o the auncient veelage o Karmrashen, which contains the kirk o Hnevank, the monument o Yot Verk Matur, numerous khachkars, an some tombs. Owerleukin Teyseba an Lake Sevan. Tsovinar is locatit in the distance tae the left. Cuneiform inscription o Rusa I at the base o the hill o Teyseba, near the road leadin towards Artsvanist. Brady Kiesling, Rediscovering Armenia, p. 46; oreeginal airchived at Archive.org, an current version online on Armeniapedia.org. This page wis last eeditit on 11 Mairch 2018, at 02:35.